This is a great option for a family outing and suitable for kids of all ages. 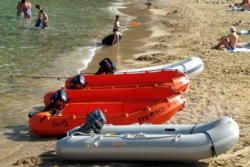 To get on a nifty little Zodiac boat and cruise around the coast, swimming & snorkelling. Back to the beach for a delicious and traditional Paella lunch. · 10:00 Pick up from wherever you are. · 10:30 Arrive at the Can Marca Caves. · 15:30 Pick up & return home. This tour is 95€ per person but if there are children under 12 in your group, please let us know so that prices & menu can be adjusted accordingly.